Death, taxes, and stepping on a LEGO: the three universal inevitabilities. We can’t tell you how to prevent any of them, but we can offer some scientific insight into that last item. 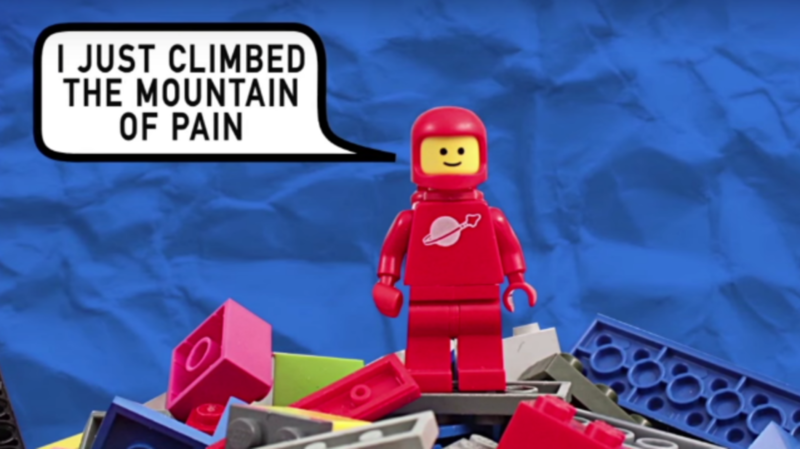 Check out the video below from the American Chemical Society for a brief overview of the physiology, chemistry, and physics of stepping on a LEGO. The struggle is real, and really painful for a number of reasons. Start with the soles of your tender feet, which are bristling with as many as 200,000 sensory receptors apiece. This is generally a good thing; your body needs tactile information about where your feet are taking you, and if it’s safe to continue. Pain is a way of signaling that your feet are in danger. The problem is that, well, pain hurts. The pain is then compounded by the little bricks themselves, which are chemically engineered to be nearly indestructible. As a result, the bricks’ nubs and sharp corners mash into your foot, amplifying your pain receptors’ cries for help. The third layer of pain arises from the actual force of your foot upon the LEGO. Physics textbooks often note the seeming paradox of the stiletto and the elephant—that a 100-pound woman in stiletto heels exerts more pressure on the ground (or some unlucky foot) than a 6000-pound elephant. The same principles apply here, albeit in reverse: The small surface area of the LEGO is pushed into your foot with the full force of your body weight.